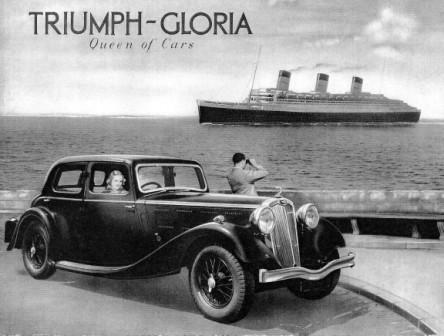 Between 1933 and 1938 Triumph made a large and confusing range of Gloria sporting saloons, coupes, tourers, 2-seater sports cars, drophead coupes and golfer’s coupes. 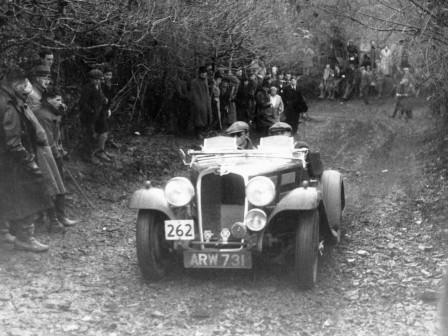 All these Glorias, apart from the final two models ( 1.5-Litre Saloon and Fourteen Six-Light Saloon) were powered by 4 or 6 cylinder Coventry Climax overhead inlet and side exhaust valve designed engines (modified & built by Triumph). From August 1934 to 1936 the Gloria range included ‘Gloria Vitesse’ models (not to be confused with later Vitesses) which were up-rated, engine & equipment, versions of the equivalent Gloria and slightly different bodywork in the case of some saloons..
August 1933 to July 1934 4-cylinder Glorias- 9.53 h.p. 1,087cc 4-cylinder overhead inlet & side exhaust valve engine with free-wheel pre-selection 4-speed gearbox. August 1933 to July 1934 6-cylinder Glorias- 12.95 h.p. 1,476cc 6-cylinder overhead inlet & side exhaust valve engine with free-wheel pre-selection 4-speed gearbox. August 1934 to July 1935 4-cylinder Glorias- 10.8 h.p. 1,232cc 4-cylinder overhead inlet & side exhaust valve engine with free-wheel pre-selection 4-speed gearbox. August 1934 to July 1935 6-cylinder Glorias- 15.72 h.p. 1,991cc 6-cylinder overhead inlet & side exhaust valve engine with free-wheel pre-selection 4-speed gearbox. * Flow-Free bodywork now mounted on a later 1938 2-litre Vitesse Saloon chassis. August 1935 to July 1937 4-cylinder Glorias- 10.8 h.p. 1,232cc 4-cylinder overhead inlet & side exhaust valve engine with free-wheel pre-selection 4-speed gearbox. August 1935 to July 1936 6-cylinder Glorias- 15.72 h.p. 1,991cc 6-cylinder overhead inlet & side exhaust valve engine with free-wheel pre-selection 4-speed gearbox. 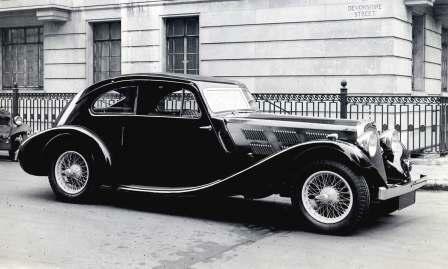 Early 1937 to July 1937 Gloria 1.5 Litre Saloon – 11.81 h.p. 1,496cc 4-cylinder overhead valve engine with 4-speed synchromesh gearbox. This was the first of 2 Gloria models to use the new Triumph overhead valve engine. 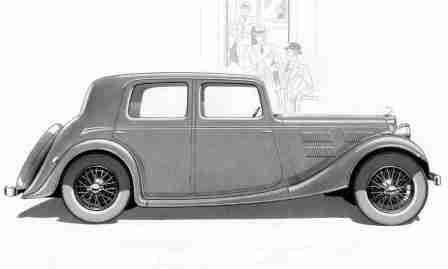 Its bodywork was almost the same as the proceeding Gloria Twelve Saloon, but now had a full width rear bumper (instead of the quarter bumpers) and a more rounded radiator grille surround (as used on Vitesses). 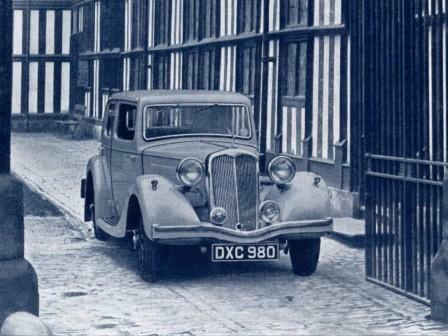 It was priced at £285 and was the cheapest model available in 1937. We estimate that 250 were produced. We have recorded 39 with 3 surviving with their original style bodywork. 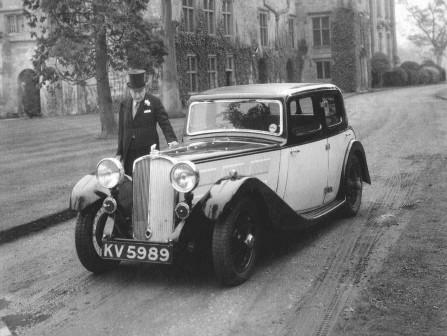 August 1937 to July 1938 Gloria Fourteen Six-Light Saloon – 13.95 h.p. 1,767cc 4-cylinder overhead valve engine with 4-speed gearbox. This was the last Triumph to bare the Gloria name. 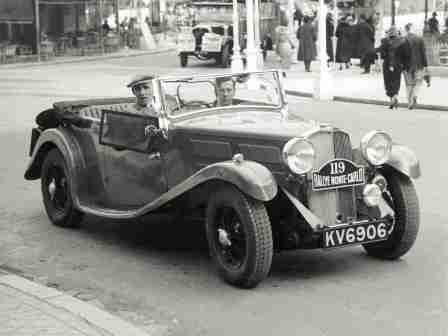 Apart from the radiator badge its external appearance is identical to the Vitesse 14/60 Six-Light Saloon produced alongside this model. The only difference appears that the level of interior fittings was lower than the Vitesse. It was priced at £298 compared with the Vitesse’s £318. We estimate that 200 were produced. We have recorded 29 with 4 surviving, of which 2 retain their original style bodywork.